This lovely, bright 5 bedroom, 3 washroom "Olde Muskoka",100+ year old cottage is perfect for family fun. The large wicker furnished sun-room with porch swing is just a few steps from the lake. Boathouse has all you need to enjoy the lake-canoe, kayak, pedal boat and dock furniture. Single boat slip. On cooler days, enjoy sitting around the fireplace or playing at the games table in the large living room. The large, windowed dining room seats 8-10. Weber BBQ and patio table and chairs for informal outdoor eating. The upstairs has a large porch with a swing off of the master bedroom. Reduction in rates for last minute bookings and off-season can be considered. 2 week minimum stays for high season. The waterfront has both a shallow area and water deep enough for diving off of the diving board on the dock. Desirable southwest exposure allows for longer sunny days and later sunsets. The boathouse has dock furniture and toys and room for a boat. An added feature to the property is a full shuffleboard court and benches. Perfectly located close to downtown Port Carling for convenient shopping and services. I finally have the pleasure of writing a review for our favorite summer cottage that our family of 5 has been vacationing at regularly for years now (I can't believe we are the 1st to review it). It has been an ideal place for my boys to grow up and my elderly mother to enjoy with us during the summers (she has vision issues and is able to get around well on the fairly flat grounds). 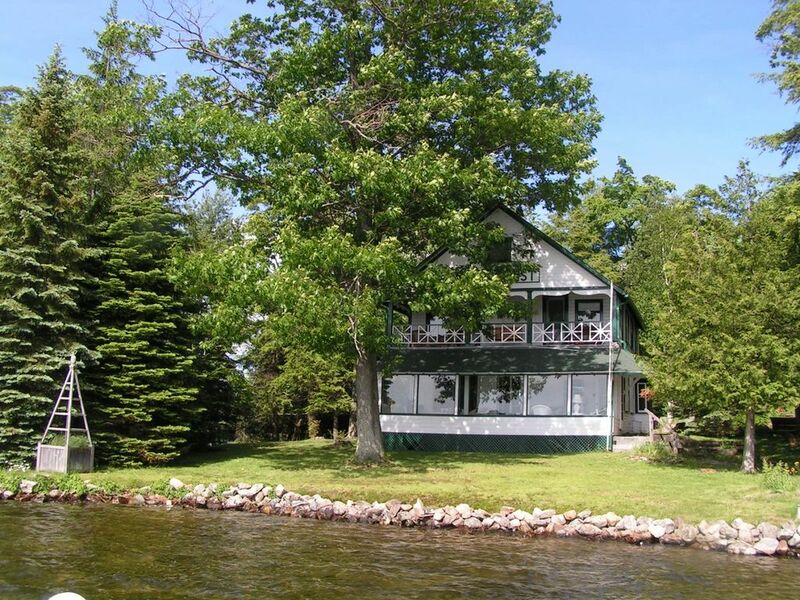 The location is absolutely ideal...quiet and away from Port Carling yet easily reachable by land or water. Quaint Port Carling has everything you could need: shopping, restaurants, grocery store, bakery, library, etc. We especially like the positioning of the cottage on the quiet little bay where we hang out on the dock, swim, boat and have diving competitions from the "classic" diving board. A small thing yet significant to us...the dock is made out of some special kind of wood that does not splinter! Our barefooted kids have a reaped the benefit of that! Also, the property sits next to the historic Canoe Cut that you can find in history books of the area. We love seeing the occasional canoers in the distance paddle through the small waterway opening in the woods almost as much as we enjoy paddling through ourselves. The cottage itself is very beautiful and just great for our family. Although really old, it is maintained well and every year they seem to make little (and sometimes big) improvements. Lots of windows, lots of porch space, plenty of bedrooms, a laundry room and a really well appointed kitchen. We especially like grilling on the Weber BBQ. Don't miss the sunsets from the enclosed porch. What are the cons of this property? I would say it wouldn't be for you if you wanted a new cottage with all the modern amenities...this one is more classic (although they recently added wi-fi, thank you!). As "city folk", we initially had to get used to the nighttime noises from critters, the occasional power outage and how to properly respect a septic system. In sum, we highly recommend this property and you will be in good hands with the really nice owners who live next door, across the Canoe Cut. 3 Night Holidays in May and October- $1,900 Reduction in rates for last minute bookings can be considered. 2 week minimum stays for high season.